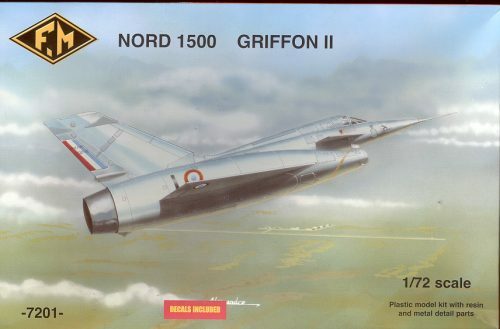 Thanks to the experience gained with 1402 Gerfaut, Nord developed a more advanced research aircraft, the Nord 1500.01 Griffon, which was to fly with a turbojet for takeoff and a ramjet for cruise flight. This aircraft was characterized by a delta wing equipped with elevons and forward canards. Powered originally by a turbojet Atar 101G-2, then then by Atar 101F. It accomplished its first flight in September 1955. At the end of the flight tests, the airframe was modified to accommodate the Atar 101E-3 3.500kgp and the ramjet designed by Nord. The redesigned 1500.02 Griffon II, it was characterized by a coaxial provision of the Atar engine and ramjet, with the possibility of making the two systems operate simultaneously. This combination took off for the first time on January 23, 1957 and carried out more than 200 flights until 1959. The performance was excellent, during a trial flight in October 1959, speed reached was 2.330 km/h to 16.400 m of altitude. Unfortunately, it was not enough to get a contract for a production aircraft. The aircraft is preserved at the Museum of Air and Space at Le Bourget. The kit comes in the usual F.M. box with a great box art showing an early Griffon II in flight from its most photogenic angle. Face it, the plane really is not a looker in any sense of the word. However, it is the kind of aircraft that I like because it is weird and experimental. The French put a lot of effort and testing into trying to get a viable ramjet powered interceptor. The theory was good, but the end result is that ramjets are jut too fuel thirsty and require some other mode of power to get them to operating speeds. Anyway, if you have ever seen/built any of the various French short run kits, then this one will look quite familiar. The plastic parts are on a single sprue and there are also metal bits, resin bits and an etched fret to go along with things. Two vacuformed canopies are provided. The kit has all the right ingredients for an excellent model. Now let's take a closer look at those ingredients. The plastic bits have fairly good detailing. It is all engraved and though a bit 'soft', not out of character for a low production, low-pressure molded kit. 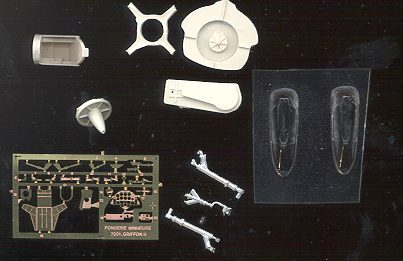 The surface of all the plastic parts has a rough, pebbly texture. Since this is a bare metal plane, it means that you'll have to either put on several coats of gloss paint to smooth the surface or you'll have to sand every part until it is smooth. I know I've commented on this before, but I can't see why these folks can't do a smooth external surface. The parts all have some level of flash that will have to be removed as well. There were no ejector pin marks nor any areas that had sink marks. The metal bits are for the landing gear. These have mold seam lines that will need to be removed, and while the nose gear looks a bit fragile where it attaches to the wheel, it should be strong enough. BTW, this plane will need nose weight as it is pretty 'short coupled', meaning the nose gear and main landing gear are pretty close to each other. No mention of this need is given in the instructions. While it may mean that it doesn't need any, I'm not taking any chances! Resin parts are fairly well done, but not as good as they could be. 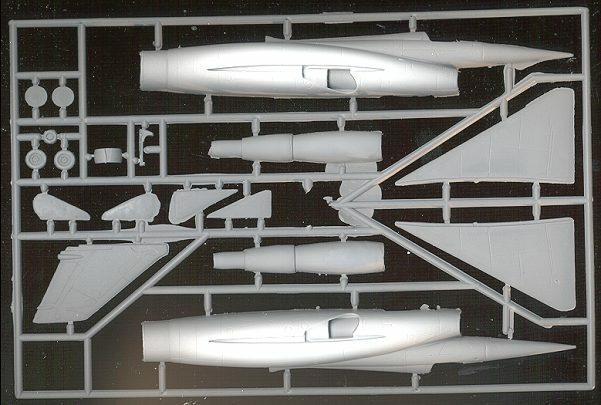 They are basically for the cockpit tub, nose gear well and for some engine components. A nice part about them is that it seems as if little in the way of cleaning up or removing excess resin is required. That will be quite nice. 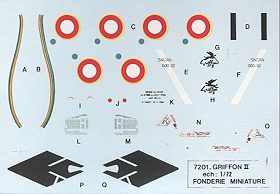 There is a very nice etched fret for cockpit bits, landing gear oleo scissors and a few other bits and pieces. Finally we come to the vac canopies. They are not good. One of them is rife with air bubbles so is basically unusable. They both are almost completely lacking in frame detail. The builder is going to have to take a bunch of educated guesses as to where the canopy frame lines are to go. One thing I can say is that if one wishes to update this kit to represent the plane in its final flights, it had a more normal canopy without all the frames from that kitted by FM. I've included a nice photo below to show the final version. Most of the changes are to the fin so it should be relatively simple to do the update. Of course, it is quite possible that the canopy was mostly clear on the starboard side and with multiple panes on the port side. Instructions are what we have all come to expect from FM. They are two folded standard sheets of paper. On one of them is a very good four view for decal placement with an inset drawing of the cockpit. The other sheet has a very brief history (in French) with several construction steps. Rather basic as usual, but for most of us, it is more than enough to be able to build the model. Color information is given in a small chart. It states Zinc Chromate for the wheel wells and inner gear doors, but I wonder if that is green or yellow? Probably yellow as green was not much used after WWII. Decals are for the one prototype. They are well printed, though my set suffered from the yellow being off register. Fortunately, aftermarket French roundels are not difficult to find. As to how well they work, my past experience has shown them to be thin, rather easy to tear and they can be stubborn unless you have some strong setting solution. The Tricolor on the fin will have to be painted as all that is provided is the white stripe. It is really quite nice to see some of these interesting and a bit odd French experimental types being kitted. While I'm sure many would prefer 1/48, 1/72 is just fine with me and a lot others. Perhaps this will start a trend with FM and we'll see other interesting types. Recommended only for experienced modelers. If you would like your product reviewed fairly and quickly by asite that has well over 175,000 visitors a month, please contactme or see other details in the Note toContributors.